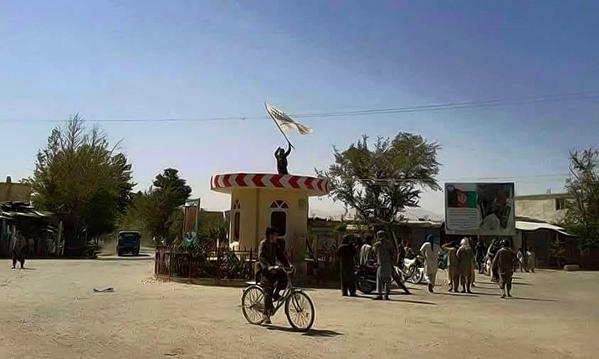 < A Taliban fighter raises the group’s white banner in Dasht-i-Archi. Image from the Taliban’s Voice of Jihad. The Taliban launched a suicide assault on the parliament building in the Afghan capital of Kabul today. At the same time, two contested districts in the northern province of Kunduz, where the Taliban launched a major offensive at the end of April, have fallen to the Taliban. Meanwhile, the jihadist group has renewed its push to regain control of districts in the southern province of Helmand. The Taliban claimed credit for today’s attack in the capital on its website, Voice of Jihad, stating that “multiple martyrdom seekers of [the] Islamic Emirate … armed with heavy and light weapons” assaulted the heavily secured seat of government. The attack in Kabul began after a suicide bomber penetrated rings of security around the parliament building and detonated his vehicle at the main gate at approximately 10:30 a.m. Armed Taliban fighters then attempted to enter the breach created by the suicide bomber, but were repelled by Afghan forces after several hours of fighting. Afghan officials claimed that seven Taliban fighters who participated in the attack, including the suicide bomber, were killed. At least two civilians were killed and dozens more were wounded in the fighting. The suicide assault, or coordinated attack using one or more suicide bombers and an assault team, is a tactic frequently used by the Afghan Taliban, the Haqqani Network, the Movement of the Taliban in Pakistan, al Qaeda and its branches, allied groups such as Lashkar-e-Taiba, the Islamic Movement of Uzbekistan, and by the rival Islamic State. Suicide assaults are commonly executed by jihadist groups in Iraq, Syria, Yemen, Afghanistan, Pakistan, Somalia, and Nigeria. The Taliban have vowed to target the “foreign occupiers” and “the stooge regime,” or Afghan government, as part of this year’s spring offensive, which is called Azm, or Resolve. The jihadist group has targeted both the government and foreigners in Kabul since announcing Azm. In one of the more deadly attacks this spring, a Taliban fighter killed 14 people, including nine foreigners, in an attack on a hotel in Kabul. In addition to assaulting the parliament building in Kabul, the Taliban seized control of the districts of Chardara and Dasht-i-Archi in the northern province of Kunduz over the past three days. Taliban fighters overran the Chardara district center on June 20, and the Dasht-i-Archi district center earlier today, Afghan officials said. On Voice of Jihad, the Taliban release a photograph of a fighter raising the Taliban’s white banner in Dasht-i-Archi. Just after the offensive began, an Afghan official claimed that 65 percent of the province is under Taliban control. The loss of Chardara and Dasht-i-Archi means that four of the seven districts of Kunduz are likely under Taliban control. Helmand province, a traditional Taliban stronghold in the Afghan south, has also been under assault by the jihadist group. Late last week, Taliban fighters “sacked part of the center of Musa Qala District, according to the residents, setting a clinic on fire and destroying government vehicles parked at a major police station,” The New York Times reported. The Taliban claimed that “the [Musa Qala] district police HQ building was completely overrun, 24 police including the commander – Sabir – and 3 hireling commando troopers were killed and dozens of others wounded” during the attack. Much of Helmand province has been contested since last summer, when an al Qaeda and Taliban-linked group known as Junood al Fida claimed it took control of the remote southern district of Registan. The Taliban overran the central district of Sangin one year ago, and the district is contested. Baghran is thought to be under Taliban control, as is much of Kajaki. The US and NATO end its combat mission in Afghanistan in December 2014 and the limited number of forces have shifted to an advise and support role. Less than 10,000 US troops and several thousand NATO personnel remain in Afghanistan. As the US withdrew the bulk of its forces last year, the Taliban stepped up operations in southern, western, and eastern Afghanistan and have taken control of several districts and currently contests others throughout the country. most unfortunate development. The Afghan Government & Security Apparatus messed up from the get go. As soon as this Force showed up en masse the Afghan Government should have responded with everything available & then some. It still reasonably within their repertorie to respond effectively & decisively. The longer they wait though the degree of difficulty increases accordingly. Till such action, if ever, they’re stuck with this problem throughout the duration of the Fighting Season. Once again our Generals show they can’t train Foreign Armies. The key to a successful military is non-corrupt officers, and a non-corrupt government. Neither is present in Afghanistan and that is their fault as they had administrative control. So the Taliban will keep gaining and improving unless IS flips it. All of these movements were publicly foretold years ago when Obama said we would leave.Money was sent to” train” Afgan recruits. Recruits who for the most part were illiterate in their own language, nor capable of understanding different dialects in their country. Even with the use of translators, how much could possibly get through with those problems at.the very point of hands on training. Mostly these recruits are individuals not wanted by the Taliban in the first place. I have friends deploying to Kandahar, they will be members of the last QRF deployed to Afghanistan. But their primary function is to close the base, Leatherneck is closing too. When it is done only a token presence of American interest hardly amounting to real help will be based in Bagram. Of course if the Taliban takes the country over we will not have to allow our conscience bother us as to how we abandoned people to something as despicable as the radical violent interpretation and practices of Islam inflicted by the Taliban on the rest of the Afghan peoples. I know that bothers a lot of my buddies what kind of life are those children, women and friends left behind expect to be able to live under the Taliban’s sharia law tyranny. We have done nothing to look at the source which is the Koran and the more conservative your country is ie Saudi, Iran and Pakistan the more Islamic you are compared to the likes of Indonesia, Malaysia etc! There are people in the muslim world who believe that the Taliban was the closest thing to living in a true Islamic state. Check the foreigners who think the same about the Caliphate in Iraq and Syria and travel there for their Islamic paradise. The ones left in the West are only here to conquest/convert us and receive welfare benefits without working which must be the Islamic dream! How would they cope in a true Islamic state with no Government handouts? @Paul Hundreds of millions of Muslims and the majority of the ulema manage to be devoted to the Koran and Sunnah without being terrorists or terrorist apologists/sympathizers. But what to do about the large number of delusional and willingly under-informed Muslims with romantic ideas about the Taliban and ISIS? I dunno but I think the response must be a little more nuanced than “Blame the Koran”. There is an unfortunate tendency among more reactionary Westerners to essentially make the argument that “if we could just get together and hate them them hard enough and hold them in enough contempt the problem would solve itself”.